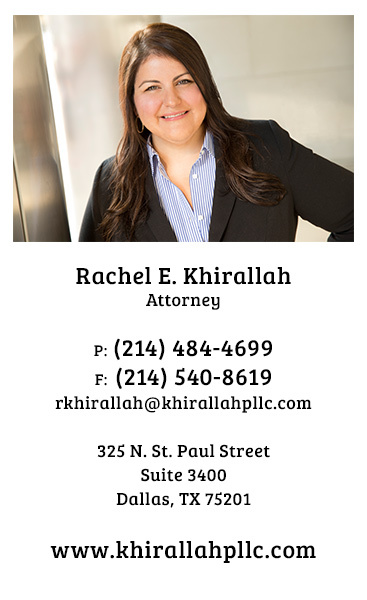 Rachel E. Khirallah is the founder of Khirallah, PLLC. She was admitted to the Texas Bar and U.S. District Court, Northern District of Texas in 2005 after graduating from Texas Tech University School of Law, and admitted to the U.S District Court, Eastern District of Texas in 2006. While attending law school, Rachel was selected to serve on the Executive Board of the Texas Tech Law Review, the Board of Barristers, the American Trial Lawyers Association Mock Trial National Team, and the American Bar Association Negotiations National Team. Prior to law school, Rachel obtained her Master’s in Business Administration from the University of Dallas in Irving, Texas in 2001. She obtained her Bachelor of Arts degree in Spanish along with a minor in English from Regis University in Denver, Colorado in 1996. Currently, Rachel is a member of the State Bar of Texas, Dallas Young Lawyers Association, and the Dallas Volunteer Attorney Program, where she routinely accepts pro-bono cases. 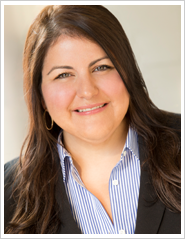 She is a highly active member of Attorneys Serving the Community, an organization that supports local nonprofit organizations whose programs benefit women, children, and families. Rachel is parishioner at Holy Trinity Catholic Church and a member of the St. Thomas More Society. Rachel attended and is an active alumna of Ursuline Academy High School in Dallas, Texas. When not prepping for depositions or drafting motions, Rachel can be found training for marathons or taking her nieces and nephews out on adventures.